Not only is there an easy answer to that question, with a little bit of savvy, you can also be sure that your time isn’t wasted and that the content you create will almost certainly convert into a new lead or sale. In this blog post, I will outline a method of generating content that will involve a bit of practice to get right, but once mastered, you’ll never run out of content ideas again. Seriously. A lot of our blog posts are inspired by questions that clients ask over and over again but also by questions people had before arriving at our site. For example, Arnold wrote an excellent post on why you may need to redesign your website to benefit from SEO. This post was created after we found out that someone found our site after searching Google for the phrase “do I need to redesign my website to rank in google?” The person looking for an answer for this question found us at least a few pages deep so must have been quite frustrated after not finding an answer to their question. We know that when they found us, they converted into a lead (GA goal tracking).We know now that we should be number 1 or at least first page of the search results for that term, even if it doesn’t bring much traffic. Coincidentally — or perhaps not — the biggest challenge for B2B content marketers last year was “producing the kind of content that engages.” This year, the biggest challenge is “producing enough content.” Now, I wouldn’t want to confuse correlation with causation, but one possible narrative is this: to create engaging content, you need to create it (mostly) yourself. And that takes quality time and effort, a trade-off to some degree in volume. Jennifer Van Iderstyne wrote a great post about link building with answers here. However, this is only one piece of the puzzle. Jennifer is using more general and unverifiable data for her questions, which is perfectly fine. I wanted to go into a little more detail on how you can use your own data to create content that not only generate interest and traffic, but are practically guaranteed to convert. So, how do you do it? You do this using the plethora of conversion data that you already have from Google Analytics and Google AdWords. The first step is to find out what content your potential customers are looking for. Better yet, the questions your potential customers are asking before buying. Knowing what questions or concerns your customers have means that you can reach out to them and answer their concerns for them in a blog post or video before they get a chance to find your competitors offering. So how on earth do you find out what content your potential customers want to see? The answer, as always, is in the analytics. Open up Google Analytics (if it’s not already permanently open) and navigate to the “Traffic Sources -> Search -> Organic” report. You’ve probably seen this report thousands of times and are quite frankly unimpressed with the data/crumbs that Google gives you here. Fortunately, for the purposes of generating content ideas, we’re in luck. All you need to do is type a question mark in the search box as shown below. Hit enter and voilà. Instant content ideas! The report shows the search terms that your site appeared in search results for when someone typed in a question (bonus points for spotting the 81 people REALLY i. These are all visits so you know that your product or service is somewhat relevant. It gives you the ideal list of common questions, concerns and problems that your potential customers are having and need solved. Hopefully by you. Why create blog post or video content based on flimsy public keyword research when you can demonstrate that you and your company can solve their exact problem? They wont need to look elsewhere. But hold your horses, let’s fine tune this a bit more. If you have low volumes of traffic, try expanding your reports to a longer date range. Don’t be afraid to go back and see what people were asking last year. Additionally, you can fine tune by replacing the question mark with question words like “who”, “what”, “where”, “when” and “how”. Now, most of us are busy people. Rather than spending weeks/months churning out masses of content, why not make sure that you’re answering/solving the most profitable questions/problems? Let’s do some cross referencing with AdWords. 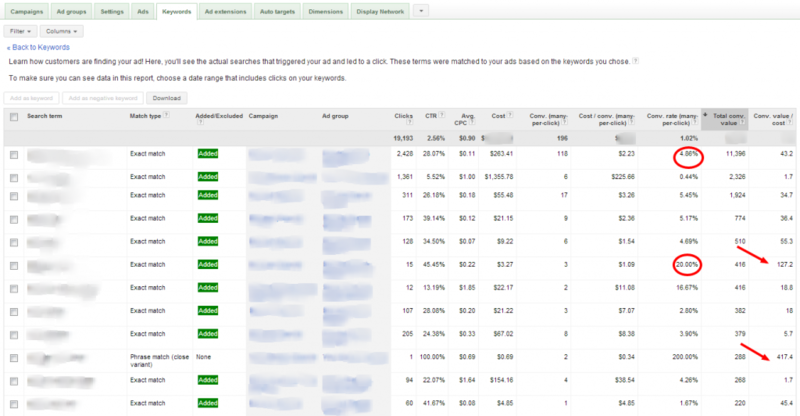 Log into AdWords and pull your actual trafficked keyword data from AdWords. 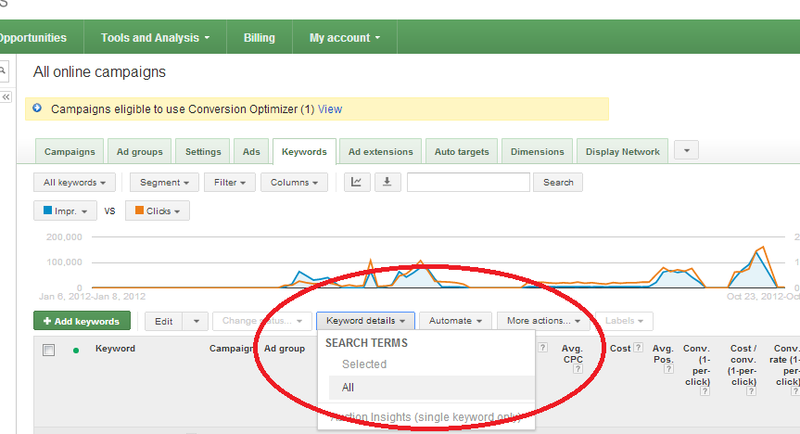 To do this, go into your AdWords account and, without selecting a campaign (or selecting one, depending on how specific you want your keywords to be), click on the “Keyword Details” option. Then select “All”. This will give you a list of all the actual keywords that sent traffic to your site and not just the keywords that triggered your ads. After AdWords goes away for a minute and pulls the data, you should be presented with a nice list of sortable keywords This is one of the most valuable pages you will find in the AdWords interface. Since Google did away with providing most organic keyword data in Google Analytics, even using Google Tag Manager, this is where you get it now. Unfortunately, you have to pay for it. As you can see, this is pretty valuable data. For the purposes of this exercise, what we’re looking to do is find some keywords with a decent conversion rate and high ROI (Conversion Value/Cost). We need to pick 2-3 keywords that not only convert well, but match the topic/question asked in step 1 above. What’s even more important is that you pick keywords that you are not already ranking in first place for. I’ll be covering the real value of these particular keywords in my next post, so stay tuned. In the screenshot above, you can see that the two keywords that we selected in the previous step are ranking in position #4 on Google.com. Those are what we’re looking for. A list of valuable topics that are actively being searched for. Not only that, but topics that you’re currently ranking somewhere for already. A (cross referenced) list of keywords that you can use in your content for internal anchor text linking and stemming. A list of proven valuable keywords that you can sprinkle into your content to improve your search rankings for. From here, with sets of topics paired with multiple keywords, you can start to build out your SEO/Content Strategy. A handy tip is to perform the above searches and researches based on this month’s data and pop the topic-keyword paired sets into the WordPress Editorial Calendar for next month’s posting schedule. If you’ve got a bigger team, you can assign topics out to multiple team members. Perhaps the team member who could write most authoritatively on the topic. The new content is bound to generate more search data and the cycle continues helping you become an authority in your niche. The title of the post(s) should be the question itself to help with the link anchor text. If people link to you with the exact question as the anchor text, you should have no problem ranking organically for the question itself and it’s very common for people to link to sites using the title of the post or title tag of the post (Yes, they can be different and in most cases should). Use Site Search. 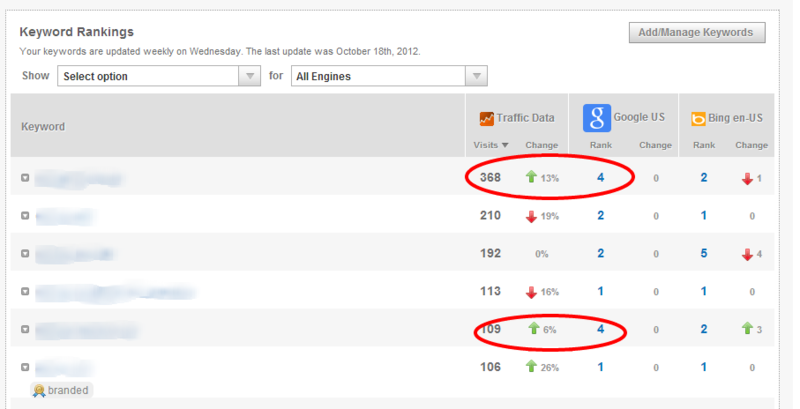 Go to the “Content -> Site Search -> Search Terms” report in Google Analytics. Here you’ll get a slightly more general idea of the questions potential customers are asking when they’re on your site, but you’re not answering. So there you have it. No need to to guess what content you need to be producing. Your potential customers are already telling you. This is the very reason that we here at Redfly created the extremely popular Google PPC tutorials series. They now drive almost 40% of our site traffic and have resulted in hundreds of conversions. All from typing a question mark into a search box! What questions are your customers asking that you could be answering? Brilliant article Dave. We’ve been working through a system like this for our clients also. Thanks for sharing! This is sound advice and a great process to follow for creating valuable content on your blog. I follow a similar protocol and find that this approach definitely drives traffic and engages readers. Thanks for spelling everything out! This is great advice. Particularly step 2. I expect many people will go as far as looking at what keywords are bringing people to their site, then writing more content around those subjects, but cross-referencing with AdWords to ensure you’re focusing on the most profitable areas is an excellent suggestion. Thanks for this – great reminder – I know I should use the analytics and ads data more!